Teddy Roosevelt once said, “The nation behaves well if it treats its natural resources as assets which it must turn over to the next generation increased, and not impaired, in value.” He was, of course, talking about our great national parks; but, the same sentiment can apply to Johns Creek, Georgia. If our city does not treat its green spaces as assets to preserve for the next generation, it ultimately has failed its citizenry. From the ashes arose the Phoenix, and out of the ruin that was once a magnificent parcel of land on the south side of Johns Creek arises the opportunity to acquire a potential green space gem for the City. The reasons for acquiring Dean Gardens, this 58-acre parcel on the Chattahoochee River, are endless. First, Dean Gardens could provide a park for a significantly underserved area of Johns Creek. In the current land use plan, this property was identified as a “distinctive area.” Indeed, one of the primary goals for this “distinctive area” was to use the Metropolitan River Protection Act to investigate measures to protect the Chattahoochee River as an important resource. That document envisioned improvements being made to the Old Alabama Road corridor, with additional multi-use trails and sidewalks connecting adjacent neighborhoods to parks (including the Autrey Mill Nature Preserve), and creating a multi-trail network along the river that residents could enjoy. In short, this property could be an important part of a future greenway plan for the residents in lower Johns Creek. Newtown Park is terribly overused. Dean Gardens parkland could provide relief to the fast-paced Newtown scene. Residents who might prefer a more passive park for walking, biking, or simply enjoying an afternoon read along the Chattahoochee River would have a wonderful option in a pastoral setting. Although Mayor Bodker states that the City has attempted to purchase Dean Gardens “a half dozen times,” discussions on such an acquisition have taken place during executive sessions, which are not subject to open record requests. Thus, we don’t know the amount the City offered in exchange for the land. We do know, however, that this property has been sold twice – once for approximately $7.2 million to Tyler Perry, and again to Lennar-Atlanta for approximately $10.5 million. Both purchase prices were considered true bargains at the time, considering the tremendous potential of the asset. 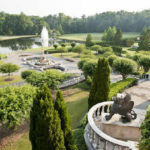 What is amazing is that the citizens of Johns Creek have a remarkable third and most likely last chance to purchase this property – would Johns Creek residents see acquiring Dean Gardens as a good use of their tax dollars? When Lennar-Atlanta requested rezoning of the property to allow for 70 single-family houses, there was considerable pushback from neighbors and efforts to improve the plan, but there was no legal rationale for the city to deny this zoning; sadly destruction of the considerable assets that made Dean Gardens truly remarkable was almost immediate. While the property has been stripped of these amenities, it still is a 58-acre property along the Chattahoochee River – a true value in its own right. With an eye to dynamic park development, Dean Gardens could once again become a jewel for Johns Creek. So how can the City afford to purchase Dean Gardens? One option is to use park bond money. Of the five parks recommended by staff – all are north of State Bridge Road. Why not potentially develop these five green spaces more slowly or less intensely. Do the voting citizens who live south of State Bridge Road really want all the park bond money directed north of State Bridge Road? Do the citizens who live south of State Bridge Road in the lower half of Johns Creek deserve green space? Cauley Creek, the intended target for a large portion of the recently approved park bond money, could still be developed; as the present parks bond currently has millions set aside for future park acquisition (http://www.johnscreekga.gov/parksbond) or if necessary the suggested plans for Cauley Creek could be scaled down (it is currently slated for roughly 900 parking spots and a competitive athletic facility – is that what the citizens truly want – see the plan the city has developed for this parkland at: http://www.johnscreekga.gov/JCGA/Media/PDF-Parks/Cauley-Creek-Park-Prelim-php.pdf) If this parkland is made less intense it could allow for the purchase of this riverfront resource in Area 3 along the Old Alabama Road corridor where no parkland currently exists. This wise use of park bond money would result in parks for both the north and south quadrants of the City, thereby impacting more citizens with the park bond money. Furthermore, to help drive down the purchase price, Johns Creek might apply for a conservation easement on much of the property; this would prohibit development on much of the property that is currently impeded by impervious restrictions. Certainly Lennar-Atlanta could either donate or drastically reduce the asking price on behalf of the city thus allowing a significant tax advantage to their corporation. In addition, the City could pursue federal and state grants for the protection of land on the river. The one certainty is that every person in Johns Creek desires to preserve green space and parkland for future generations as Teddy Roosevelt suggested. Purchasing Dean Gardens is an option that’s too attractive to pass up. Given the considerable brain trust residing in Johns Creek and managing our great City, there’s no doubt we can find a reasonable way to add this outstanding parcel to our inventory of precious green space. If the city agreed to scale way back on the Cauley Creek property I would be in agreement of the purchase of the Dean Gardens / Lennar property as long as the suggestions made were followed. Excellent article Irene! Now is the time to put this property into the equation and let the NEW council have a say in whether it makes sense for the city to purchase. When decisions were made earlier to pass on this property, it was not in the context of having the bond money available. It needs to be reevaluated now. Thank you for the interest and work you are doing to save this unique property. The city has been presented with a development plan for Cauley Creek that will cost in excess of $50MM when all is said-and-done. The scale of the effort is not appropriate, and the immediate neighbors will be inundated by traffic generated by the expected tournaments that will be attracted. When considering the anticipated usage of such a park, it’s clear that it’s not designed with Johns Creek residents in mind as the primary beneficiaries of that park. We are better served by scaling back the proposed plans for Cauley Creek, and focusing on amenities that will serve Johns Creek residents for their enjoyment. The savings could be invested in the acquisition and development of Dean Gardens. We’d achieve better distribution of our parks for residents, and better align with amenities that Johns Creek residents’ desires. Agreed! Dean Gardens would be a huge asset to the Johns Creek community. Irene, thank you for creating more awareness of this opportunity!